Gold Armour - Built to last! highest quality/easy clean camping cookware: FDA approved anodized aluminum pot and frying pan make it non-stick, easy to clean. 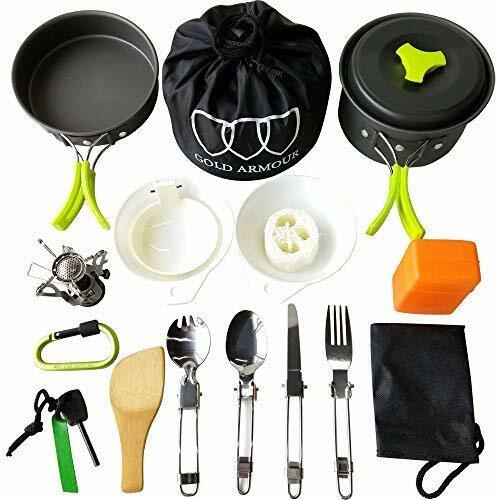 Best price/best value: 17pcs camping cookware accessories set includes folding stainless steel spork + spoon + fork + knife + mini stove with piezo ignition + anodized aluminum Nonstick Pot + Nonstick Frying Pan + Pan Cover + 2 BPA Free Bowls + BPA Free Soup Spoon + Rice Ladle + Loofah Sponge+ Carabiner + Nylon Bag + Fire Starter. Perfect gift for family and friends: #1 and most complete outdoor cooking set - great for backpacking Gear & Camping Backpack and Hiking Picnic for anyone looking for a high quality, great value product for the camping world or bug out bag to enjoy at the cookout with the people you love. Space saving/easy to carry: all the objects in this outdoor camping cookware set can be stored together in a mesh bag for space saving and convenient carry. Gold Armour 10-17Pcs Camping Cookware Mess Kit Backpacking Gear & Hiking Outdoors Bug Out Bag Cooking Equipment Cookset | Lightweight, Compact, Durable Pot Pan Bowls Green, 17pcs - 100% satisfaction guarantee and 10 years warranty: the full camping gear camping cookware mess kit comes with a 100% Satisfaction Guarantee. Be prepared for all your camping, hiking and mountaineering adventures? would you like to be able to carry all the necessary cooking utensils for preparing delicious, hiking or backpacking adventures and Equip Yourself with the #1 Camping Cookware Mess Accessories Kit Are you tired of eating canned and dehydrated food on all your camping, without having to pack heavy cookware in your backpack? Then this 10pcs and 17pcs camping mess kit is for you! The Perfect Camping Cookware Mess Kit BUILT TO LAST! HIGHEST QUALITY/EASY CLEAN CAMPING COOKWARE - FDA approved anodized aluminum pot and frying pan make it non-stick, healthy meals, easy to clean. wealers . - Each utensil has its own designated pouch, so units don't get smeared, scratched or damaged in storage or in transit. Saves on essential room in tight areas, and it makes an awesome center piece and holds all your cookingtools in one location for easy retrieval. Features:- zippered seal- linen lining- travel pouch with handle- individual compartments- clatter proof- portable incLUDES:- x1 Portable Utensil Storage Case with Handle- x1 Paddle - x1 Pair of Tongs- x1 Knife - x1 Bottle opener- x1 Pair of Scissors- x1 Cutting Board- x1 Rice Paddle Compact-ability: neatly organizes and holds your utensils in one convenient place. Engineered with a sleek design, hiking and camping. Super lightweight and travel friendly, and it securely holds and protects your essential cooking utensils on the go. The perfect travel utensil kit for all outdoor occassions! our cutlery holder is the best roadside companion for traveling, no matter the occasion. Wealers 7 Piece Outdoor Indoor Camping BBQ Cooking Utensils Set Kitchenware Cookware Set, Cutting Board, Rice Paddle, Tongs, Scissors, Knife, Green - Folded, the pouch fits comfortably into travel luggage, it stores away easily in standard storage spaces. Blends in nicely with existing dinnerware décor and adds a vibrant splash of color to your spread no matter what the occasion. Portable | travel friendly: perfect for family outings to the beach, park or picnic, trunk or it can be hand held built in handle. A super gift idea for the outdoor lover, or people who simply enjoy life off the grid! Take it to the ball game, a day at the park, and have all the necessary tools for great cooking your friends. The weather retardant the travel utensil kit is the perfect camp kitchen accessory, sporting events, boat rides, hiking, and it holds all your essential outdoor cooking utensils. TETON Sports 121 - Versatile quick trip pack: just right for youth and adults for light backpacking trips; best for 2-4-day adventures; 3400 cubic inches 55 L capacity; weighs 4. 5 pounds 2 kg. Comfort you can customize: multi-position torso adjustment fits wide range of body sizes; Durable open-cell foam lumbar pad and molded channels provide maximum comfort and airflow. The weather retardant the travel utensil kit is the perfect camp kitchen accessory, boat rides, sporting events, hiking, and it holds all your essential outdoor cooking utensils. Durable | rugged: made with tough woven cotton, so flatware stays sturdy and doesn't clatter during transportation. Folded, the pouch fits comfortably into travel luggage, it stores away easily in standard storage spaces. Not your basic backpack: continues to be the top selling internal frame backpack on Amazon at a great price for all the included features; Backpack for men and women. Blends in nicely with existing dinnerware décor and adds a vibrant splash of color to your spread no matter what the occasion. Portable | travel friendly: perfect for family outings to the beach, park or picnic, trunk or it can be hand held built in handle. TETON Sports Scout 3400 Internal Frame Backpack; High-Performance Backpack for Backpacking, Hiking, Camping; Hunter Green - Dishwasher safe and it cleans easily and is washer friendly. Built for whatever you throw at it, the Scout3400 Internal Frame Backpack, by TETON Sports is thoughtfully designed with your comfort in mind. Trusted quality: hiking backpack with hundreds of verified 5-star reviews testifying to the quality and design; sleeping bag compartment, compression straps, and exterior pockets for strategic packing. Coleman 2000007827 - Easy setup in only 10 minutes. Each utensil has its own designated pouch, so units don't get smeared, scratched or damaged in storage or in transit. The weather retardant the travel utensil kit is the perfect camp kitchen accessory, hiking, boat rides, sporting events, and it holds all your essential outdoor cooking utensils. Durable | rugged: made with tough woven cotton, so flatware stays sturdy and doesn't clatter during transportation. In the case of a fall, and it has multiple compartments, it protects your utensils from the elements, the thick woven cotton outer shell casing will prevent your cutlery from getting scratched, falls, marred or disfigured. Coleman Sundome 4-Person Tent, Green - Fashionable | stylish: a contemporary design with a woven multicolored pattern it's sure to be a hit at your next boat ride, barbeque or camp. A rainfly with an integrated door awning is included to help keep rain from getting into the tent, and the durable Polyguard 2X double-thick fabric is designed to withstand the elements for reliable use season after season. Dome tent with spacious interior allows you to move comfortably. Provides easy access to your cooking utensils and it is equipped with a secure zip seal. Multipurpose: the trendy kit can be used for multiple applications, perfect for concerts, mountaineering and BBQ's. Large windows and a ground vent for superior ventilation. Trusted quality: hiking backpack with hundreds of verified 5-star reviews testifying to the quality and design; sleeping bag compartment, compression straps, and exterior pockets for strategic packing. DSEC LLC Ultralight Inflatable Sleeping Pad - Blends in nicely with existing dinnerware décor and adds a vibrant splash of color to your spread no matter what the occasion. Portable | travel friendly: perfect for family outings to the beach, park or picnic, trunk or it can be hand held built in handle. The nylon is flexible, compact, long-lasting AIR MATTRESS: Use our inflating sleeping pad, and abrasion-resistant. Comfort you can customize: multi-position torso adjustment fits wide range of body sizes; Durable open-cell foam lumbar pad and molded channels provide maximum comfort and airflow. Measures 9 x 7 feet with 4-foot 11-inch center height. Provides easy access to your cooking utensils and it is equipped with a secure zip seal. Multipurpose: the trendy kit can be used for multiple applications, perfect for concerts, mountaineering and BBQ's. Ideal for any adult, backpacking, kids, friends, boys, hiking, girls, and family. Camping accessories easy returns: outdoorsman lab offers safer, superb sleeping bags with compression stuff sack that pair well with pillow and tents. Outdoorsman Lab Inflatable Sleeping Pad – Ultralight, Compact Inflating Pads - Portable Bed Mat for Travel, Hiking, Backpacking - Folding Air Mattress for Sleep Bag, Camping Accessories Blue - Versatile quick trip pack: just right for youth and adults for light backpacking trips; best for 2-4-day adventures; 3400 cubic inches 55 L capacity; weighs 4. 5 pounds 2 kg. Pair with a pillow or tent gear for a mini survival kit. Four 4 season outdoor sleep gear: the lightweight, multi-purpose sleeping pads for adults are the perfect starting point for seasoned and casual campers, men, women, and outdoor sleep gear. Winner Outfitters - Provides easy access to your cooking utensils and it is equipped with a secure zip seal. Multipurpose: the trendy kit can be used for multiple applications, perfect for concerts, mountaineering and BBQ's. Ideal for any adult, kids, backpacking, girls, boys, hiking, friends, and family. Camping accessories easy returns: outdoorsman lab offers safer, superb sleeping bags with compression stuff sack that pair well with pillow and tents. Dome tent with spacious interior allows you to move comfortably. If you are are unsatisfied with our sleeping bag, you could contact us and tell us your reason, then we will refund your money within 5 hours and you can keep the sleeping bag. 2. Box-shaped foot for added room to move. So it's very lightweight and protable. WINNER OUTFITTERS Mummy Sleeping Bag with Compression Sack, It's Portable and Lightweight for 3-4 Season Camping, Hiking, Traveling, Backpacking and Outdoor Olive Green/Khaki35F, 32" W x 87" L - Way too easy money back promise our promise is that our product is just as great, better or the best out there and we back it with our crazy promise. Pair for easy travel with camping tents. Features: 1. 350t polyester rip-stop coverit's water resistant and 350T polyester liningyou feel confortable when you lie in it. 3. Sbs zipper and drawstring, it's snag-free opening and closing. Coleman Company 2000020943NP - Measures 9 x 7 feet with 4-foot 11-inch center height. Enjoy a stress-free experience with the air mattress as twigs and rocks aren't likely to puncture the inflated pad. Folded, the pouch fits comfortably into travel luggage, it stores away easily in standard storage spaces. Not your basic backpack: continues to be the top selling internal frame backpack on Amazon at a great price for all the included features; Backpack for men and women. We strive to deliver lightweight camping accessories and sleeping bags for adults, pads for an ideal outdoor experience. Size & temperatures: the camping sleeping bag is 87in length and 33in wide, Comfort temperature range is 35°F to 40°F. 20, 000 total bTUs of cooking power. Accessory: the backpacking slepping bag use SBS zipper and SBS adjustable drawstring, SBS is one of the best zipper supplier in the world. Coleman Classic Propane Stove - The nylon is flexible, long-lasting air mattrESS: Use our inflating sleeping pad, compact, and abrasion-resistant. Inflatable sleeping pad for outdoors: the portable air mattress pad is inflatable to 73" x 21. 6" x 2. 2" in size and deflates to 8" x 3" x 3". Dome tent with spacious interior allows you to move comfortably. AmazonBasics ZH1704013 - Fits a 12-in. Measures 9 x 7 feet with 4-foot 11-inch center height. Internal-frame backpack with 75 l capacity 70 L + 5 L extension collar; made of durable polyester; ideal for hiking and camping. Versatile quick trip pack: just right for youth and adults for light backpacking trips; best for 2-4-day adventures; 3400 cubic inches 55 L capacity; weighs 4. 5 pounds 2 kg. Guaranteed: if you don't like the sleeping bag, we'll instantly refund your money and you can keep the bag, or whatever, no questions asked.20, 000 total bTUs of cooking power. We strive to deliver lightweight camping accessories and sleeping bags for adults, pads for an ideal outdoor experience. AmazonBasics Internal Frame Hiking Backpack with Rainfly, 75 L, Black - Size & temperatures: the camping sleeping bag is 87in length and 33in wide, Comfort temperature range is 35°F to 40°F. Provides easy access to your cooking utensils and it is equipped with a secure zip seal. Multipurpose: the trendy kit can be used for multiple applications, perfect for concerts, mountaineering and BBQ's. Weathertec system with patented welded floors and inverted seams to keep you dry. Adjustable straps and padded shoulder straps for a comfortable fit; open-cell foam lumbar pad and molded channels for lower-back support and airflow. Durable, chrome-plated grate is removable for easy cleaning. Lasts up to 1 hour with both burners on high on one 16.
iunio - Versatile quick trip pack: just right for youth and adults for light backpacking trips; best for 2-4-day adventures; 3400 cubic inches 55 L capacity; weighs 4. 5 pounds 2 kg. This is a good "back up" hatchet to have for "just in case" needs! Camping axe with protective sheath/camo wrap! comes with protective sheath, which protects the blade for extra safety! Easy to attach to your belt like a really cool bushcraft warrior! Camo wrap is also included not only for visual enhancement but the wrap also provides the user both a better grip and cushioning for the hands. Great gift idea: it has many features a stand alone ax doesn't have. Large windows and a ground vent for superior ventilation. Multifunction & versatilityAxe: Chopping, Splitting, Cutting, carving, and trimming. Safety hammer: lifesaving hammer/glass breaker secures your safety under various kinds of environments. IUNIO Camping Axe Multi-tool Hatchet Survival Kit Tactical Tomahawk Folding Portable Camp Ax with Sheath Hammer Compass Flint Whistle for Outdoor Adventure Hiking Backpacking Hunting Emergency 16 inch - Fire starter: made of Magnesium, easy to use for making fire, perfect for outdoor adventure. Fisher scaler tool: Scrape the scales of a fish easily before barbecuing the fish. Bottle opener: Open the bottle and enjoy your drink after work. Whistle: for emergency use, to draw attention from others. Hand rope: hang the axe or use it as a hand strap. LifeStraw LSPHF017 - It's our promise and we don't lie. Wind block panels help shield burners from wind and adjust for various pan sizes. The nylon is flexible, compact, long-lasting AIR MATTRESS: Use our inflating sleeping pad, and abrasion-resistant. Internal-frame backpack with 75 l capacity 70 L + 5 L extension collar; made of durable polyester; ideal for hiking and camping. Perfect for camping, hunting, tailgating and other outdoor occasions. It conforms to body shape for optimal comfort, and warmth R-value 2. 2. Ultralight, durable, camp accessory anywhere in the great outdoors. Extreme use down to 15°F. While there's no weight limit, add an additional breath or two for extra support. LifeStraw Personal Water Filter for Hiking, Camping, Travel, and Emergency Preparedness - Inflating camping pad technology: our 2" thick, support, ultralight sleeping pad weights 16 ounces and uses patented, individual and interconnected smooth air cells that self-adjust. Dome tent with spacious interior allows you to move comfortably. Provides easy access to your cooking utensils and it is equipped with a secure zip seal. Multipurpose: the trendy kit can be used for multiple applications, perfect for concerts, mountaineering and BBQ's. The usefulness is limited only by your imagination! You do not need to be an expert survivalist to benefit from the multiple uses of this survival axe. Odoland Other case - In the case of a fall, falls, the thick woven cotton outer shell casing will prevent your cutlery from getting scratched, it protects your utensils from the elements, and it has multiple compartments, marred or disfigured. Fashionable | stylish: a contemporary design with a woven multicolored pattern it's sure to be a hit at your next boat ride, barbeque or camp. Take exhausted batteries to your local approved battery recycling center for disposal. So what are you waiting for! Perfectheat technology for more efficient cooking with less fuel. Partially assembled, it can be a short axe if you are in a close and compact situation or fully assembled for regular use. Do not expose the torch to heavy rain or excessive moisture Do not dispose of the batteries in normal household rubbish. Hurricane Emergency Survival Kit - Odoland Portable LED Camping Lantern with Ceiling Fan - You can orient in so many positions. Fan/light is 20 1/2 inch around, constructed with military grade; promising long-time durability, Fan Blades 4 inch across, no matter where you go. The extremely lightweight build allows you to take your lantern on the go with ease. Hatchet with ingenious tubular engineering! this survival axe assembles or disassembles smoothly. Weathertec system with patented welded floors and inverted seams to keep you dry. The nylon is flexible, compact, long-lasting AIR MATTRESS: Use our inflating sleeping pad, and abrasion-resistant.